Alina is about to turn 30, and we&apos;ve been talking a lot about how it&apos;s a really big milestone - especially for women. It&apos;s been almost three years since I turned that corner myself, and it&apos;s kind of crazy looking back at how drastically things have changed since then. I even had a series at one point about things I learned after turning 30 - important lessons on my relationships, career, self-worth, and so much more. I definitely think women receive more societal pressure to cross things off by a certain age, and that navigating those norms can be challenging. Because we&apos;re currently at different stages of life, even with a relatively small age gap, I thought it would be fun to sit down and have Alina and I answer the same questions about life paths. How important is it to push the boundaries of your comfort zone? Emily: For someone who often fights change, I place even more importance on the idea that I should be stepping out of my comfort zone with increased regularity. The older I&apos;ve gotten, the more I&apos;ve realized that the opportunities that make me the most scared are usually the ones that are going to produce the most impactful change. So my new motto is: if it makes me nervous, it&apos;s probably something I should consider, whether that relates to my job, friendships, or as a parent. Alina: It&apos;s absolutely critical. It&apos;s the most important thing you will ever do for yourself. You have to push boundaries - it&apos;s true what all the clichéd Instagram memes say: the space beyond your comfort zone really is where life happens. The most satisfaction, fulfillment, pride, and joy you will feel is after making big life changes that feel simultaneously scary and right. You have to take risks - it&apos;s your one life, you don&apos;t want to live with regrets. Do you feel as if you&apos;ve controlled the path your life has taken so far? Emily: I do. I&apos;ve made very conscious, thought-out decisions that have let me believe that I have some control over my path. I&apos;m a proactive person, so if there&apos;s something I&apos;m interested in, I&apos;ll try to find a way to make it happen. Alina: Absolutely, ten thousand percent. When you&apos;re living a life you want to be living, it&apos;s easy to unwittingly blur the details of how it happened and marvel from a distance at your good fortune. As a 25-year-old, I would not have believed I&apos;d be working at Cupcakes and Cashmere and it still feels surreal. But when I look back, it wouldn&apos;t have happened without taking initiative on many steps along the way. Where I&apos;m at now, in my career and life in general, is the direct result of countless decisions made, actions and steps taken, hard work, and risks. What would you say yes to today that you didn&apos;t in the past? Emily: An opportunity that is a bit open-ended. Whether it&apos;s a cocktail party where I&apos;m not sure if I&apos;ll know other people or a meeting addressing a new business venture, I used to decline things if I didn&apos;t feel like I knew what to expect. Now I try to embrace those opportunities since there&apos;s something empowering about going into something without having everything figured out and perfectly planned. Alina: Honestly I can&apos;t think of anything! I&apos;ve always been a spontaneous, "game," yes person and there really isn&apos;t anything I&apos;ve said no to in the past I&apos;d say yes to today. I&apos;d have more to say if the question were about things I&apos;d say no to today that I said yes to in the past. Was being a mother always something you envisioned for yourself? Emily: Not necessarily. I wasn&apos;t one of those girls that "played house" and envisioned being a mother of four. Even shortly before turning 30 I remember asking G if he&apos;d be okay if our family consisted only of us and our cats. But I increasingly started to think about doing things with kids - making pancakes on a Saturday morning, going to a pumpkin patch, or re-watching my favorite childhood movies. That&apos;s when I knew I really wanted to become a mom. Alina: The answer to this question for me is simultaneously yes and no. Yes, I always envisioned myself being the matriarch of an emotionally healthy family and having children to share life with. On the other hand and at the exact same time, no. I&apos;ve always identified more with women who have chosen a life path without children. I think when I see women my age or older/younger being moms, I have more of a longing for something fascinating to me that I&apos;d like to experience, but it also feels overwhelming. However, when I see women who are in their early-40s and don&apos;t have kids [yet], I feel more of a sense of belonging - a kindredness, like: that&apos;s me. The jury is still out on whether I will have kids or not. If we&apos;re listening to the phrase, don&apos;t sweat the small stuff, what constitutes small stuff? Emily: The older I get, the smaller the stuff becomes. An old boss once told me not to stress about anything that won&apos;t matter in a year. And it&apos;s so true. If you&apos;re stuck in a traffic jam or don&apos;t get to the rest of your to-do list, that doesn&apos;t play much of a role in your life in the long term. On a daily basis, the small stuff includes: not finding time to exercise, whether or not I can get Sloan to wear a barrette in her hair, or if we leave dirty dishes in the sink. Those things would have bothered me at one point, but now I try to let them slide off my back. Alina: Material possessions. If I really love something, of course I am sad if I&apos;ve misplaced it, and possessions can carry real meaning and sentimental value - but ultimately all that matters is humans. Beyond possessions, any issues that will pass and don&apos;t have to do with personal relationships are the small stuff. It&apos;s easier to sweat these problems on a given day, but if you can envision a bigger picture (like Emily said - a year down the road, or even sooner), you can get perspective and realize it will soon be forgotten. What advice have you been given that you actually don&apos;t think is helpful? Emily: People advised me not to leave my day job in order to pursue my blog full-time, which wasn&apos;t considered a legitimate career path. It was easily the riskiest professional decision I&apos;ve made to this day, but also the most rewarding. Alina: Tons, mostly all having to do with change and risk - don&apos;t move to L.A., don&apos;t quit your secure job, etc. 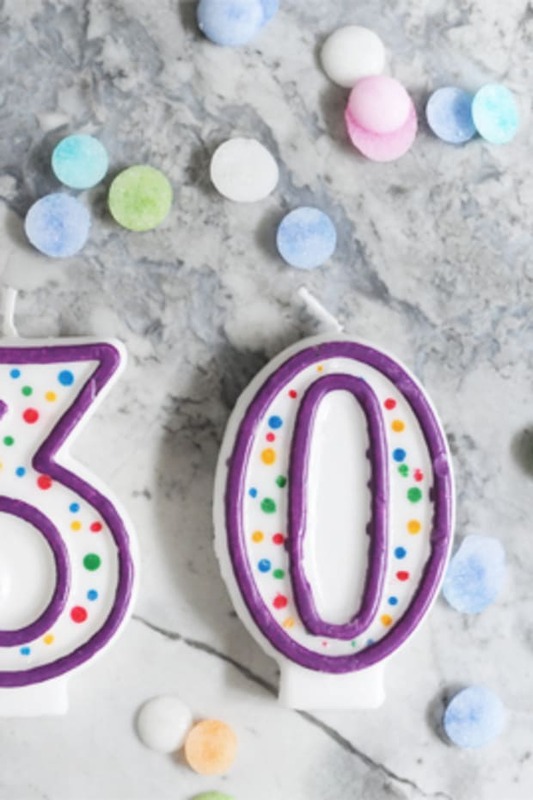 What do you feel like you CAN&apos;T do now that you&apos;re 30 that you did in your 20s? Emily: Have more than two drinks without getting a hangover. Alina: Skimp on sleep. I was never good at it in my 20s but I still did it. If I do it now my body basically breaks down. I can&apos;t not sleep. How do you feel in general about the path you&apos;re on versus external pressures to check off specific milestones by a certain age? Emily: Now that I&apos;m in my 30s I feel less pressure to do things by a certain point. I&apos;m more content and secure with where I am, so I don&apos;t find myself as affected by things I "should" be doing. Alina: I believe we&apos;re all on the exact journey and path we&apos;re meant to be on, and there is celebration in that. The older I&apos;ve gotten, the more I&apos;ve accepted the idea that if I was meant to be married to a foreign artist living in South America, with two young babies teaching English (or whatever other fantasies we imagine), I would be. If being a young married mom was really my destiny, I&apos;d be doing it already. But I&apos;m not, so it can&apos;t be my true course. You&apos;re doing exactly what you&apos;re supposed to be doing.